"I’ve always been fascinated and inspired by planetary exploration. Producing artist’s impressions of solar system bodies like Enceladus or Titan allows me to fuel my reflections or the imagination. I try to use, as much as possible, science data to generate my artist’s renderings. 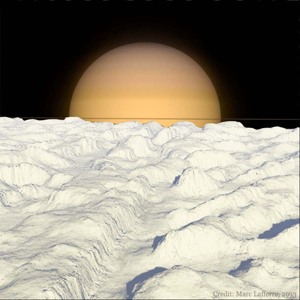 This image reveals an artist’s impression of Baghdad Sulcus, one of the Tiger Stripes found in the south pole of Enceladus. The geysers identified in the south polar region are closely related to these Tiger Stripes. From the surface of Enceladus, the apparent diameter of Saturn is about 29 degrees which is roughly 58 times higher than the apparent diameter of the Moon (about 0.5 degrees) for an observer located on Earth. The artist’s impression of Enceladus has been generated on the basis of a mosaic of Enceladus obtained from the Cassini probe on November 21, 2009 with high resolution data from the ISS (Imaging Science Subsystem) and the CIRS (Composite Infrared Spectrometer). The artist’s rendering was produced via the “Shape From Shading” technique. Saturn appears on the horizon such as it would appear on a photo taken by an observer on Enceladus with a typical camera or smartphone with a lateral field of view of 57 degrees."